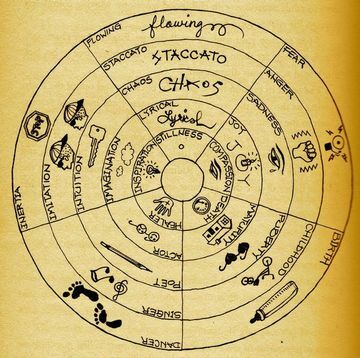 The 5Rhythms – Flowing Staccato Chaos Lyrical Stillness ™ – are states of Being. They are a map to everywhere we want to go, on all planes of consciousness – inner and outer, forward and back, physical, emotional and intellectual. In Flowing, we physically practice the art of being fluid in our bodies. Flowing is the pipeline to our inner truth, the impulse to follow the flow of one’s own energy, to be true to oneself—listening and attending to our needs, receptive to our inner and outer worlds. When we open up to the flow of our physical beings, all other pathways open. It is one of the most beautiful and fascinating ways of dancing—to be in, to be around, and to watch. Men and women that embody the Rhythm of Flowing are supple, flexible, surrendered and trust their feet to lead them where they are meant to go. In Staccato we physically practice the power of masculine energy. It is percussive and strong and promotes connection with the rest of the world. Staccato is the gateway to the heart. It shows us how to step out into the world connected to our feet and our feelings. This rhythm is the ruler of our linear world, the ruler of the warrior part of us, the part of us that shows up as truth and clarity. It is the part of us that stands up for what we care about, who we love, and what we love. Staccato is the fierce teacher of boundaries. And it is the protector and ambassador of our fluid being. Visually, a man or woman fully embodied in the Rhythm of Staccato is defined, clear, connected and not fearful of the transparent expression of their heart. Whether dancing Staccato alone, in partnership, or in groups—it is always a powerful experience. In Chaos we physically practice the art of fully releasing our bodies – we let go of the head, spine, hips and feet and move faster than we can think. Chaos breaks us free of our illusions and throws us headfirst into the beat. It takes us on the journey from “I can’t” to “I will”. The simple practices of Chaos immediately bring us back to our bodies, to the moment. This rhythm liberates us from all ideas about who we are and gives us a real experience of being total, free, intuitive and creative. Chaos is the gateway to the big mind. Dancing Chaos is the practice of going into the unknown, not fearing what’s on the other side. Visually we look like a big, hot, giant, sweaty mess overflowing with cathartic energy. This is our big dance, our break out dance, our break through dance. In Lyrical we practice the art of coming out of Chaos. It is the physical, energetic, emotional and spiritual dancing rebirth. The practice of Lyrical teaches us how to break out of destructive patterns and surrender into the depths of the fluid, creative repetitions of our soulful self, bubbling up from the deepest parts of ourselves, to the integrity and dignity that we often forget is within us. Lyrical is expansive and connects us to our humanity, timeless rhythms, repetitions, patterns and cycles. Lyrical is more of a state of being than a Rhythm, as it can be a crystal clear expression of any of the Rhythms in their lightness. We become light in our feet, like birds flying in the air—but make no mistake, in Lyrical we are grounded and fully empowered. Being Still and doing Nothing are totally different. Stillness moves, both within and all around us. The dance is our vehicle, our destination is the Rhythm of Stillness; our challenge is to be a vessel that keeps moving and changing. Physically, in the dance of Stillness, we move in slow motion—like highly unpredictable meditative Tai Chi masters. Shapes from the past, the present and the future come through us—shapes of the Feminine and the Masculine and the magic dance they do together. Moving in Stillness and being still in motion fuses the accumulation of our bodies’ life experiences into our true wisdom. Eventually we dissolve into sitting meditation, where all the other Rhythms of our journey converge in the vital resonance of Stillness. Each time we dance into Stillness, we practice the art of making humble and mindful endings interpreted by our higher connected self. This carries through to all of our endings in life—the end of this dance, this day, this relationship, or this life cycle. Good endings mean taking responsibility for the whole journey, distilling wisdom from our experience so that we may begin the next wave or cycle clean and not carrying the past with us.